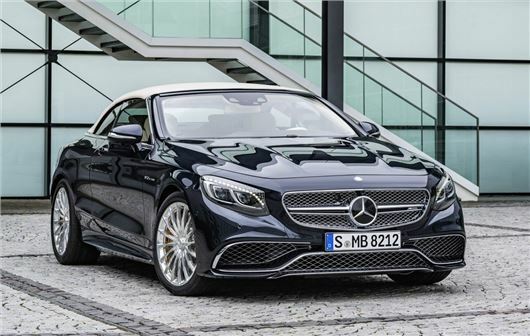 Mercedes-Benz has revealed the new S65 Cabriolet which goes on sale next April. It will cost close to an eye-watering £200,000, making it the most expensive S-Class in the range. Powered by a monster 6.0-litre V12 biturbo engine, the S65 Cabriolet has a mammoth 630PS and 1000Nm of torque. And all those big numbers give it a 0-62mph time of just 4.1 seconds. And not that owners will be worried about economy, but according to the official figures it will average 23.5mpg. The multi-layered acoustic fabric roof can be opened and close on the move at speeds up to 31mph and takes around 17 seconds. Once down it neatly folds into the rear deck and there's an electrically operated, retractable partition in the boot. Standard equipment includes the Mercedes-Benz Airscarf system which blows warm air from the base of the headrests to keep you warm if you have the roof down on a cold day. The S65 Cabriolet also has 20-inch ceramic high-sheen alloys and Airmatic sports suspension with variable damping. To reduce overall weight Mercedes-Benz has fitted a lithium-ion battery which replaces both the starter and back-up batteries, plus the S65 Cabriolet also has the option of high performance ceramic brakes.